Get two Poi Balls at a cool price! Create awesome and dazzling light shows! Perform your own unique Poi Dance! 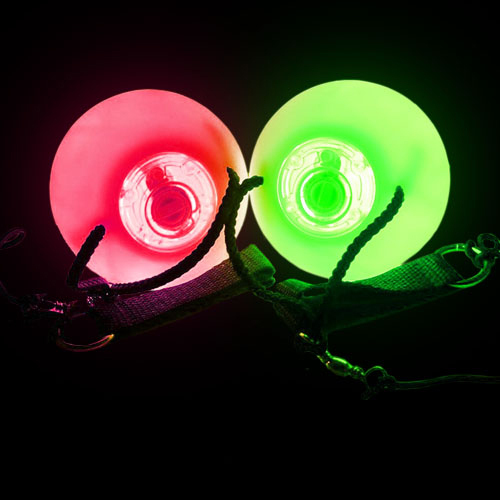 Having one LED Poi Ball is cool, but having two Poi Ball's swinging around at once is totally awesome! This cool twin pack of CoolThings Australia LED Poi Balls are a great way to have fun, day or night, individually or in group, take yours to a park, dance club, beach, or use them at home by putting on some good music and coming up with your own cool Poi dance style. Poi is a form of Maori dance art that originated with the Maori people of New Zealand where the dancer swings the Poi through a variety of rhythmical movements to create geometric patterns in the air. Each Poi dancer is required to have high concentration and coordination in order to not hit themselves. Over the years Poi has evolved and expanded all over the world and can often be seen at large rave festivals, dance clubs, dance schools, circuses, and performed in group choreography shows with vocal and musical accompaniment. Practicing Poi improves concentration, coordination, is great for fitness and is fun to use for both kids and adults. You can also to have extra fun making amazing art pictures with the LED Poi ball. Use your smartphone and Instagram yourself or your friend making different shape patterns and colours, then form your own Poi art gallery. Long Life Batteries are pre-installed and replaceable. Each LED Poi Ball requires 3 x LR44/AG13 batteries which you get included, this means as soon as your two Poi Balls arrive you'll be all set to start creating your unique Poi dance style. The lights are very vibrant. High quality product. Just what I was expecting. When ordering my product it was the last item in stock, one of the workers messaged me to notify me that they had tested the item I wished to purchase and it wasn’t up the the quality standard they expect at cool things. They ensured that they sent me the product in perfect condition. I purchased these as a Christmas gift for my 10 year old niece who loves dancing. They got a fair bit of use on Christmas day and I could see that she was interested in the challenge of learning how to use them well. Very happy with this purchase. The delivery was prompt and exactly what I was expecting. The poi balls are unreal.